It’s nearly a week late, but since I’m in the middle of the next recipe already, I need to clear this one out of the queue. 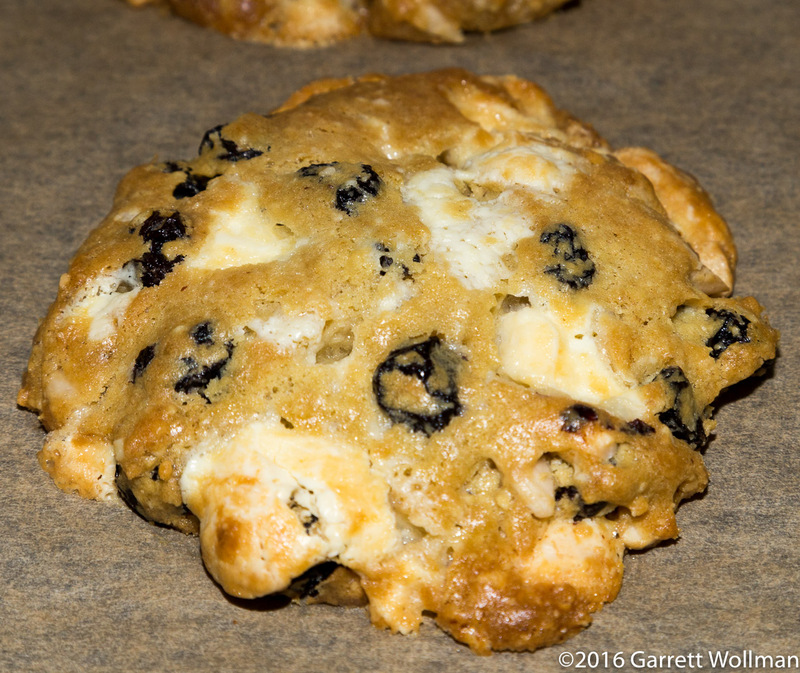 White Chocolate–Cherry–Almond cookies are one of Joanne Chang’s newer recipes, from her Baking with Less Sugar (Chronicle Books, 2015; p. 47). I’ve had varied results from this cookbook, and these cookies were rather disappointing: they turned out quite cakey, and more than one taster asked me if they were muffin tops. They weren’t bad, just not particularly good, and the satisfaction:calorie ratio was not high enough to justify a repeat visit. But since I took all these pictures, I’m going to do the walkthrough anyway. 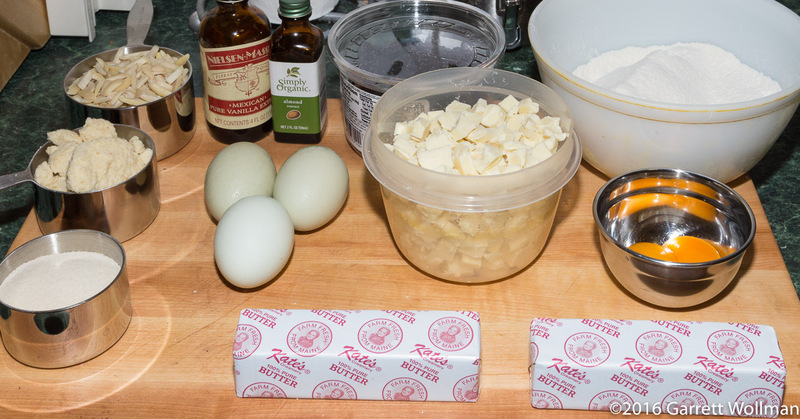 We start, of course, with the mise en place. There are quite a few ingredients, including three different sources of almond flavor. The wet team starts with 225 g of unsalted butter (softened, of course) and a mere 75 g of sugar. Unlike what this photo shows, there are three egg yolks and only two whole eggs (and yes, those are blue “heirloom breed” eggs, just because I felt like buying them that day when I realized I didn’t have enough). The wet works continue with an enormous 2 tbl (30 ml) of vanilla extract and 2 tsp of almond extract. The dry team consists of 120 g of slivered almonds, 70 g almond meal (a bit chunky in the photo because I took it out of the freezer), 230 g all-purpose flour, 1 tsp each of baking soda and kosher salt, 335 g of white chocolate chunks (Callebaut was all I got get easily), and 200 g of unsweetened dried cherries. I was supposed to “coarsely chop” about half of the dried cherries, but totally forgot to do this. After resting in the refrigerator overnight, the dough is ready to portion. The recipe makes about 1300 g of dough, and has a stated yield of 16–20 cookies, so I decided to aim for 65 g portions, which I was able to approximate using a #20 (1.6 fl.oz. or a scant 50 ml) disher. Before baking the dough balls, they should be squashed flat with the palm of one’s hand — it’s probably a good idea to moisten your hand before doing this. The cookies are baked in a 350°F (175°C) oven for about 16 minutes. The cookies cool on the baking sheet for about 10 minutes before being shifted to a wire cooling rack. In this second tray of cookies, you can see that some ended up with an excess of white-chocolate chunks and spread a bit more than is desirable. Here’s a close-up of an individual cookie. 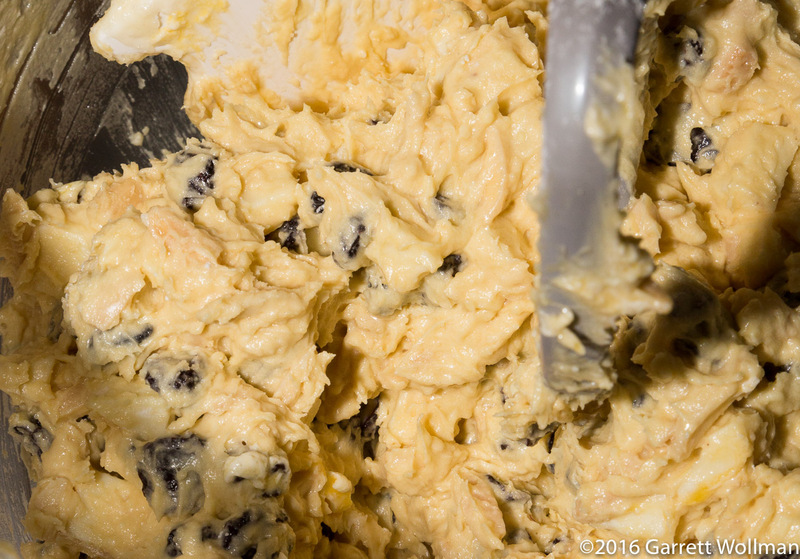 This entry was posted in Food and tagged cookies, Joanne Chang, recipe. Bookmark the permalink.